An hour's ride from Mutianyu, courtesy Mr. Yang, we reached the Summer Palace, in the north-west off the centre of Beijing. The complex which is known as Yíhé Yuán (颐和园) which literally means "Gardens of Nurtured Harmony", had been the summer retreat of some of the imperial Chinese dynasties, including the last, the Qing Dynasty. The Summer Palace is considered to be one of the finest examples garden architecture in China. The 100-odd examples of traditional architecture in the park include pavilions, terraces, temples, pagodas, waterside gazebos, covered corridors, stone bridges and the famous marble boat. The palace occupies a total area of 290 hectares, three quarters of which is made up of shallow lakes. The Summer Palace had always been in my mind, since 2005, when I met an Aman Resorts honcho. At that moment, the group was struggling to operationalise its Indian properties, but it managed to open its property in a section of the Summer Palace in record time. 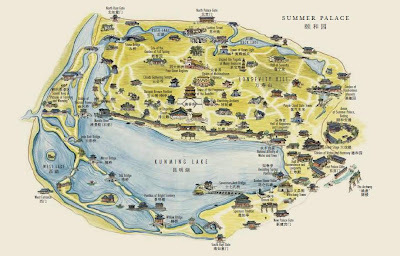 The property brochures were shared with us, and it gave me a sense that the Summer Palace was an oasis of idyllic calm. But today, despite being a Monday afternoon, it was teeming with people, hordes of people, something probably that should be accepted simply because China is indeed the most populous nation of the world. And why should I complain, for India being the second in this ranking, isn't any better on this front. Not to be outdone by the heat and the hordes, we hit the queue for the tickets and also chose to pick up an audio guide, which based on the GPS coordinates, told us the history of the Palace. In a sense, the complex exhibited the richness of China's cultural heritage. Dating back to the 1100s, this was the location for imperial gardens of the Jin Dynasty. The central feature of the Palace, the Kunming Lake was developed by the Mongol Emperor Kublai Khan in the 1300s, to act as a reservoir to meet Beijing's requirements. The Palace complex was further developed by Emperor Qianlong in 1750. However, tragedy struck in the 1860 when Anglo-French forces invaded Beijing and set ablaze many buildings in the Summer Palace. In the mid-1880s, Empress Dowager Cixi took charge of China, and diverted funds intended for the Chinese Navy to restore the complex (and thereafter China was routed by a much smaller navy from Japan). Cixi's excesses included a Marble Boat, a pavilion, built on the Kunming Lake, which looks like a marble boat. Unfortunately, politicians of today, the world over, haven't learnt from the lessons of the past. We walked past the pavilions reaching the Kunming Lake, from where we got a glimpse of the seventeen arch bridge, that connects the eastern shore with Nanhu Island. Then we took a boat ride across the Kunming Lake to the Marble Boat, which unfortunately was closed to visitors due to an ongoing renovation. The Marble Boat had been very highly recommended by my parents ever since they visited Beijing in October last year. Our boat was full of locals and Spanish tourists. The locals were extremely proud of their heritage and took pride in the fact we all foreigners were so appreciative and took avid interest in their culture and history. The boat itself was red, with a dragon face right in the front, and with intricate designs inside. Chinese dragons traditionally symbolize potent and auspicious powers, particularly control over water, rainfall, hurricane, and floods. The dragon is also a symbol of power, strength, and good luck. Traditionally, the Emperor of China used the dragon as a symbol of his imperial power and strength. In Chinese daily language, excellent and outstanding people are compared to the dragon while incapable people with no achievements are compared with other, disesteemed creatures, such as the worm. A number of Chinese proverbs and idioms feature references to the dragon, for example: "Hoping one's son will become a dragon"! Sometimes Chinese people use the term "Descendants of the Dragon" as a sign of their ethnic identity.For me, the dragon is special, for I was born in the Year of the Dragon...! The boat ride took about 20-odd minutes. Since we could not see the Marble Boat on getting off, we relaxed a bit - had a couple of bottles of sweetened yogurt, an ice-cream and a spicy grilled sausage. Then, as we were getting a bit late, we walked back along the 728 metre long "Long Corridor" - first built in 1750, the corridor was constructed so that the emperor's mother could enjoy a walk through the gardens protected from the elements. Like most of the Summer Palace, the Long Corridor was also severely damaged by fire which Anglo-French allied forces laid in 1860 during the Second Opium War, only to be rebuilt in 1886. The Long Corridor is richly decorated with paintings on the beams and the ceiling. In total there are more than 14,000 paintings, which depict episodes from Chinese classical literature, folk tales,and famous Chinese buildings and landscapes along with flowers, birds, fish, and insects. Chinese visitors over there were taking great in seeing the paintings and describing them to their kids. But then kids will be kids, at their playful best! Soon, it was time to head to Dongcheng district, for a great expedition of another kind...food! But as we left, I was struck by the remarkable creations of the medieval Chinese, their ingenuity and their love for creating something as pretty as the Summer Palace, of which I could, unfortunately, only skim the surface... But I hope to be back soon, to spend more time and soak in the experience...!